This is a precious portrait of Buddha in the Southern Song Dynasty, which was collected by Emperor Qianlong. "The treasure of the emperor of the Supreme Court": the evidence of emperor Tai's identity is one of the most important imperial seals of Emperor Qianlong. The treasure of the ancient emperor: Emperor Qianlong's imperial treasure. In history, the most loved and most capable of collecting all the treasures of the world is the Emperor Qianlong. The seal represents the Emperor Qianlong's emphasis on this Buddhist painting. Amitabha has a bun, with a round face and a solemn and solemn manner. It has two ears, a drooping shoulders, a drooping eye, a thin eyebrow, long eyes, a small mouth and thin lips, and a moustache on the upper and lower chin. 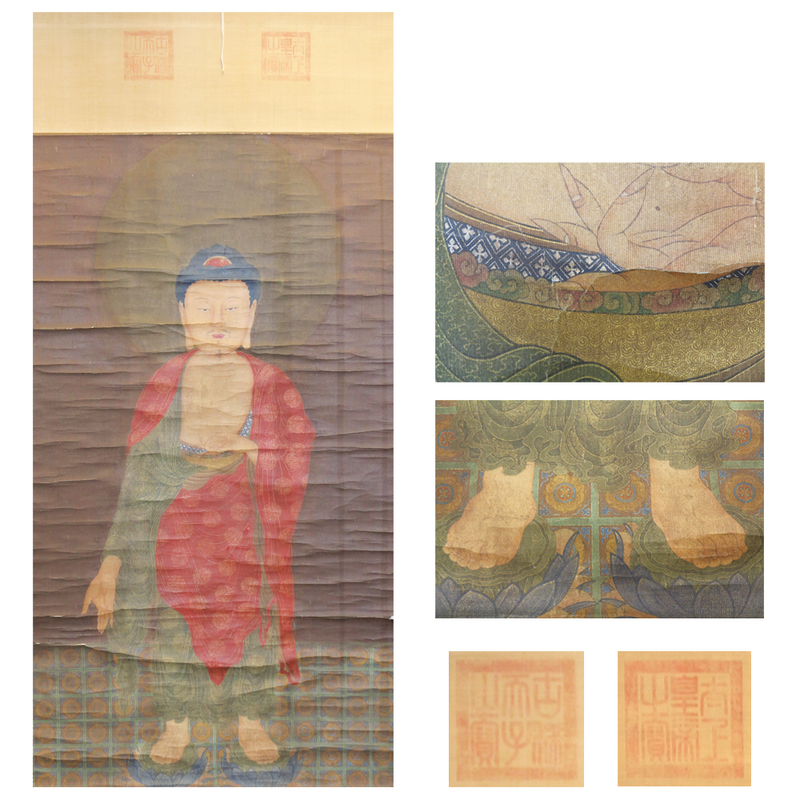 In the red chest of the Buddha dress, the left hand when the chest knot comfort seal, the right hand drooping with the wish seal, foot tread double lotus, the picture Amitabha head slightly down, two feet a front, there is the trend of walking, the miotuo from the west to the scene of the show. Excellent quality, with high collection value.